Gertie’s Nose Knows … the Value of Giving Back! Gertie Gear™, including the rescued “Gertie” rallies for Michigan Humane Society. Westland, Mich. — On October 3, 2010, a team from Gertie Gear™, maker of high style, low maintenance orthopedic pet air beds will be among the thousands who will walk in the 5th Annual Mega March for Animals at Hart Plaza in Detroit. Funds raised will go to support the Michigan Humane Society (MHS). Team “Go Gertie Go!” will include “Gertie” herself, an alumna of MHS as well as the inspiration, namesake and model for the Michigan based pet bed brand. Like many of the hundred plus animals that come to MHS each day, Gertie had a hard life. 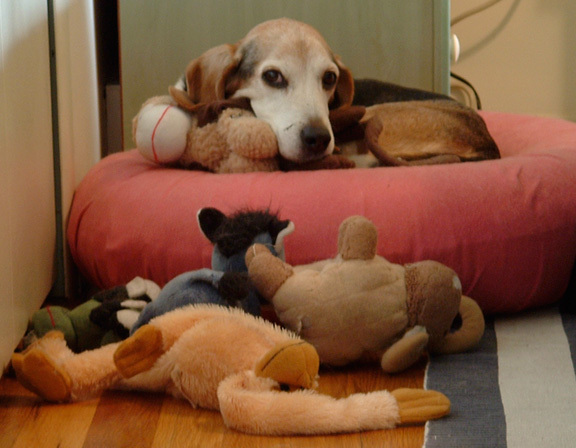 The senior beagle came to MHS as a stray in the fall of 2004. Weak, homeless and pregnant, an empathetic doctor at MHS performed surgery to remove the litter and spay her. After almost two months of recovery with a fostering volunteer, Gertie was strong enough for adoption. The Gertie Gear pet air bed system was designed with pets, their owners and the planet in mind. Each air bed set is comprised of an inflatable tube which doesn’t hold odors/allergens, an industrial claw/nail proof protective canvas undercover and choice of a wealth of slipcover fabrics. Both covers are washable and the air beds never compress nor decompose, so they outlast traditional foam/stuffing beds, including more expensive orthopedic memory foam, several times over. Gertie Gear air beds are vet recommended for orthopedic value, and a natural nesting area created by the weight of the pet conforms to the body providing complete support and comfort. When Gertie came to the Michigan Humane Society, her life expectancy was questionable. Gertie is now about 16 (almost 80 in dog years). Many of her ailments are managed with medications, a healthy diet and lots of rest. Still, old age and a neurological condition is beginning to affect the mobility of her hind legs. Gertie won’t actually be “walking” in the Mega March, but she’ll be an active participant … just from a wagon. Gertie is a happy, mischievous, determined little dog that for the most part, still gets around on her own and hasn’t had a major back pain episode since she began sleeping on her air bed – she’s been using the same one for almost three years.